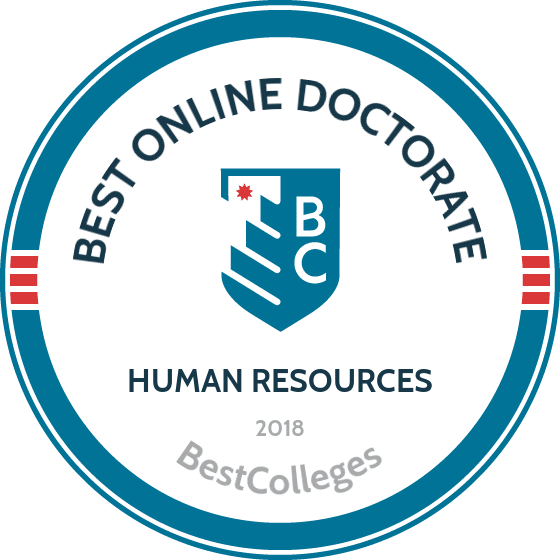 A doctorate in human resources online can help you gain the specialization necessary to earn an academic position within the field or gain employment as a research director or consultant. As a specialist in human resources management, you can expect to be equipped with the knowledge to guide organizations in their hiring practices, employee relations programs, compensation processes, and training protocols. According to the BLS, a postsecondary or professional human resources specialist earned a median annual salary of $75,430, and job opportunities are slated to grow by 13% over the next seven years. There are no universal requirements mandating that applicants to online Ph.D. programs in human resources possess work experience in order to gain admission into a program. A lot of universities do, however, create guidelines or impose employment requirements on their applicants, since experience has such a significant overall influence on a graduate's employment chances. Most human resource Ph.D. online programs will expect you to have gained some experience in business and human resources, and a general career trajectory that frames your academic interest in their program is essential to gain admission. Some online Ph.D. in human resources programs are more focused on teaching and research initiatives, others combine human resource studies with a broader business focus on labor relations, organizational leadership, law, or industrial processes. It is advisable to have clear career goals and to become well aware of the broad spectrum of program prerequisites before pursuing academic research or business practice as a focus. CAN I WORK WHILE I COMPLETE MY ONLINE DOCTORATE IN HUMAN RESOURCES? The flexibility and general availability of a typical online Ph.D. in human resources program ensures that you are able to continue working while pursuing a degree. Talk to the guidance counseling staff at the program you are considering to discuss the most appropriate degree pathway for your individual circumstances. The advantages of earning a doctorate in human resources online are self-evident, and encompass all the various potentials for your time and priorities. By remaining flexible in terms of access to courses and pace of study, an online program allows you to find a balance between current professional or family obligations and your academic life. Founded in 1971 in Lynchburg, Virginia, Liberty University is a private non-profit Christian university that offers a doctorate in human resources online. The school's doctorate in human resources online program is designed to provide advanced managerial training for individuals aspiring to enter the highest levels of marketing, consulting, and administration. The program also features three week-long intensive courses that reflect a specialization in biblical principles. Liberty University is accredited by the Southern Association of Colleges and Schools Commission on Colleges. Transfer students can submit up to half of a previously earned master’s degree towards the school's online doctoral programs in human resources, excluding certifications and licensure for some business specializations. Tuition discounts are also available for prior training, licensure, certification, and professional experience. The online doctoral program in human resources at the University of Texas in Tyler is dedicated to developing expertise in organizational development and the training of personnel for both individual and corporate performance goals. The program gives students an opportunity to leverage their experience in business to study the most pressing issues facing for-profit and nonprofit organizations. While this program is not 100% online, students are only required to meet five times per semester on campus, allowing for a high degree of flexibility in attendance for students within the state and surrounding area. Students enrolled in the school's human resource ph.d. programs online focus on projects and research in organizational development. The wide array of courses give ample room for a student to pursue individualized interests, with potential courses including advanced seminars in corporate taxation, accounting, financial analysis, and business ethics. Financial support is available through fellowships, assistantships, and teaching positions. The online Ph.D. in human resources at the University of Arkansas is especially well suited for those with a background in psychology, counseling, program design, and management design. All students must submit GRE scores to be eligible for admission to the 96-credit program. With an average course length of 15 weeks, the University of Arkansas has one of the most flexible programs in the country, enforcing no minimum hours logged per term. Those enrolled in the school's educational human resource development Ph.D. online have no campus requirements. The school accepts no transfer credit but showcases a robust support system for its students to help ensure their academic success. Online support, social forums, and an integrated app all combine to provide the highest caliber of experience and ease-of-use for distance learners. The university’s online Ph.D. program in human resources is accredited by the North Central Association of Colleges and Schools, as well as the Higher Learning Commission. The online doctoral program in human resources at the University of Illinois at Urbana-Champaign is engineered to facilitate an extensive business administration education, accessible 24/7 through an online learning portal. Emphasizing organizational development, performance improvement, and innovative training and development standards, the U of I is a leader in the field of human resources development. While the university does not require the GRE for admission, the application does require recommendations and extensive writing samples, most often in the form of a master’s thesis. The application deadline is rolling, so applicants may submit at their convenience. Tuition and basic requirements are identical for both online and traditional students. The program features coursework that provides students with a comprehensive understanding of best practices within top administrative and managerial positions. By being exposed to a wide array of methods for coordinating the activities of organizations, the online Ph.D. programs in human resources at U of I are dedicated to creating the future leaders of the business world. When deciding which course of study to undertake, it is important to consider the fact that individual programs may differ significantly. Some universities may have more of a demonstrated level of expertise in certain areas, while others may have a focus unsuited to a potential candidate's projected use of Ph.D. To get an idea of what a curriculum for a human resource development Ph.D. online program could look like, consult the list below. Some students enrolled in human resource Ph.D. programs online may have more of a focus in research areas, while others may have more of a focus in management practices. To get a general idea of what courses an online doctorate in human resources program could feature, consult the list below. Behavior Systems and Management Thought: This course explores how management protocols have developed historically, paying specific attention to the design of systems of behavior management. The writing, research, and theory related to the evolution of these systems are considered and reflected upon. Groups and Social Identity: A seminar that is designed to give an in-depth look at topics concerning teams, groups, and social identity. Extensive research and theory is examined around social psychology, organizational behavior, sport psychology, sociology, and public affairs. Social Capital: Theory and Applications: In this seminar, social capital is investigated in all its forms according to its effects on organizational behavior. Drawing on sociology, economics, organizational theory, and business strategy, the course leverages different methods in social capital research to complement lectures by senior research staff. HOW LONG DOES IT TAKE TO GET AN ONLINE DOCTORATE IN HUMAN RESOURCES? A Ph.D. program is one of the most time-intensive academic tracks an individual can strive to complete, taking as long as six to eight years to complete, depending on the amount of coursework an applicant has completed through an adjacent master's program or the type of doctorate being pursued. In addition, the pace at which a student completes coursework may vary according to their availability and commitment level. Business-centric Ph.D. programs take slightly less time than most other doctorates, with most full-time students completing all requirements within four to five years. Some online doctoral programs in human resources may begin their degree path in a cohort model, which requires applicants to enter a doctorate program together as a group to properly facilitate online discussions and forum usage. In general, requirements for completing an educational human resource development Ph.D. online include 90-120 credits of coursework, but the requirements may vary from school to school. Accreditation is important to maintain a high standard of education by differentiation between accredited schools and those that have not met a minimum standard. Regional accreditation is a process undertaken by a college or school to conform to that standard through inspection and evaluation by a third-party organization. Regional accreditation is generally considered to be more prestigious compared to national accreditation. National accreditation is a separate but necessary requirement of any college to receive federal grants or aid. There is no specific accreditation required in addition to regional or national accreditation for those earning an online doctorate in human resources, but some programs work directly with governmental bodies or local businesses and may offer exclusive internship opportunities. In addition, business-centered programs have their own accreditation bodies, such as the ACBSP (Accreditation Council for Business Schools and Programs) and the AACSB (Association to Advance Collegiate Schools of Business). The Department of Education was formed to regulate policies concerning all schools and colleges within the United States, as well as to coordinate federal assistance for education, gather data about schools, and enforce federal laws regarding education. It works to promote the success of education within the United States, but has no direct hand in the accreditation process itself. The CHEA and similar bodies work to maintain educational standards and keep universities competitive with colleges and schools within the US, and with institutions of higher learning around the world. Interested applicants may look for one of the seven organizations that make up the Council of Regional Accrediting Commissions. A list of universities with national accreditation is available directly from the U.S. Department of Education. Although a bachelor's degree can help get your foot in the door as far as consultation and teaching positions go, the employment rates are higher for business leaders who receive a graduate degree. Georgetown University's Center on Education and the Workforce (CEW) has found in a recent report that business professionals with a graduate degree, such as graduates who have completed a Ph.D. in human resources online program, faced a 4.2% unemployment rate. By comparison, the unemployment rate for business leaders with a bachelor's degree and some professional experience is recorded as 4.8%, and 7.0% for recent graduates without experience. In addition to natural variation between workplaces, the level of professional experience of a graduate or Ph.D.-holder will impact the annual earnings of a position within the industry. The following table features data from the Bureau of Labor Statistics regarding the states with the highest-paying salaries for the position of management analyst. The career paths that a human resource development online Ph.D. prepares for include the highest levels of business and administration, as well as individual entrepreneurship. Detail-oriented individuals might find satisfaction in a research position at a business school or as a professor of human resources theory and practice. More generalist-oriented individuals might find themselves gravitating towards an administrative position within a corporation or business. Whatever your inclination, a doctorate ensures the highest level of expertise and preparation. A management analyst, or management consultant researches different ways to improve the efficiency of an organization. Typically, they advise organizational managers on how to make a business more profitable. A professor, or postsecondary teacher, leads a student body through a wide variety of career, academic, and technical subjects. Professors are also intimately involved with research, student advising, and the administration of institutions of higher learning. Administrative services managers are involved with the support services within an organization, and are directly involved in the maintenance of facilities, supervision of recordkeeping, as well as mail distribution, organizational structure, and office workflow design. A training and development manager directs and coordinates all programs within an organization surrounding the training and skill-orientation of that organization's employees. They also coordinate development specialists and orientation activities. Compensation and benefits managers develop and oversee the pay structure of an organization. Retirement, health insurance, and benefits packages are all directed and managed through the office of this management position. Leading organizations in the field of human resources management have developed ways to help emerging professionals and recent graduates gain access to networking opportunities, attend conferences, and obtain career services. These organizations, such as the Society for Human Resource Management and WorldatWork, offer continued education and training in the field of human resource management. In addition, these organizations can be leveraged to forge key relationships with current business leaders in both the public and private sector. HRMAC is one of the oldest HR organizations in America, and it functions as a resource hub for human resources practitioners, leaders, and business executives. It strives to help create a dialogue around issues facing organizations, as well as connect people and grow business. SHRM is involved with promoting the human resources profession by providing certification, education, and networking opportunities to its members. The organization is also involved with lobbying the United States Congress on labor management issues. This is a global network of human resources management business leaders and professionals that focuses on motivating, attracting, and retaining employees while offering training and certification in benefits and rewards protocols. Students should do research on FAFSA loans to understand funding opportunities like scholarships, grants, loans, and work-study. Many low-interest rate funds exist with banks and lending partners in education. Certain bodies also exist to further the scholarship, grant, and fellowship opportunities for online doctoral programs in human resources candidates, such as the Society for Human Resource Management, The International Public Management Association for Human Resources, and the National Academy of Human Resources. Certain college programs are also eligible for tax breaks and some military organizations cover the cost of education in exchange for service.